In May 1942, just six months into World War II, a medical doctor in the U.S. Army went to a notary in Fort Smith, Arkansas and signed over the sale of his family farm in San Jose, California. The rushed sale “for pennies on the dollar” happened because of an order his commander in chief, President Franklin D. Roosevelt, signed two months earlier. That medic was my uncle, James Higuchi. He was among those who were forced into prisons without trials because of 9066—my grandparents, parents, aunts and uncles. Plucked from their homes and businesses in San Francisco and San Jose, they were sent to a desolate, wind-scoured plain in northwestern Wyoming called Heart Mountain. Executive Order 9066 declared that the “successful prosecution of the war requires every possible protection against espionage and against sabotage to national-defense material, national-defense premises, and national-defense utilities.” It gave the secretary of War the authority to create a zone from which certain people could be excluded from living or working. That meant my entire Japanese American family. Although the order, signed 75 years ago on February 19, 1942, never cited any specific type of race or ethnicity, it was directed at one group of people, the 120,000 people of Japanese descent who lived on the West Coast of the United States. Not only would James, along with his brother Kiyoshi, have to sell off the family farm, 14.25 acres in the heart of what is now Silicon Valley, but James would also suffer the indignity of visiting his family at an internment camp at Heart Mountain, which is located 14 miles from Cody, Wyoming. There he would stand inside the camp while wearing the same U.S. military uniform as the men who stood outside the wire that kept my family members penned inside. For the last 75 years, 9066 has been a stain on our nation’s record of freedom and respect for different beliefs. It was done out of a misguided and ill-informed fear of people whose only crime was to be from a country with which the United States was at war. If he had known the truth, Roosevelt would have realized that his government already knew that Japanese Americans posed no threat to U.S. security. The United States was also at war with Germany and Italy, yet the government didn’t round up the millions of German and Italian Americans and imprison them. Anniversaries focus thoughts on past times and events, and this is no different. But current events also raise the issues surrounding the incarceration. The election of President Donald Trump and the loose talk of him and some of his supporters of creating a registry of Muslims raises many of the same concerns from 1942. Then, as now, the United States had no tests for citizenship. If you were born here, you were a citizen. Yet those fundamentals were thrown out because of fear, the same fear we see whenever there is a terrorist event tied to Islam and Muslims. It is fundamentally un-American to institute such tests, and it defies the Constitution’s promise of freedom. We lose what makes this country great when we strip free people of their rights without trial. Some members of the Roosevelt administration, such as Attorney General Francis Biddle, understood that. They opposed the order and the imprisonment. Others, however, pushed hard to remove the people they considered a threat to security. California Attorney General Earl Warren was running for governor that year; he called Japanese Americans a threat and wanted them removed. As California governor and then chief justice of the U.S. Supreme Court, Warren would build a towering liberal reputation for civil liberties. He would later consider his support of 9066 the nadir of his public life. For my father’s family, the Higuchis of San Jose, the order meant another attack on their tenuous grip on a place in their adopted country. My grandparents, Iyekichi and Chiye Higuchi, scratched out a living as sharecroppers in the San Jose area during the first decades of the 20th century. Good fortune eluded my grandfather, who once lost an entire prune crop when heavy rains caused the farm’s water tank to overflow. But 1928 brought a radical change to my grandparents’ lives when they left sharecropping to purchase a farm near the present-day Santa Clara Valley Medical Center. They moved to a strange community, assumed a mortgage, cleared an apricot orchard, and purchased a water well, tractor, and horse. Their farm was directly behind the Curci family, and both properties shared an easement to the main road. Because California’s racist Alien Land Law was still in place, they could not own the farm in their name. They were legal aliens but aliens couldn’t own property. At first, the farm was in the name of the son of a San Francisco Japanese schoolteacher. Eventually, through the help of lawyer Saburo Kido, they were able to put the farm in the names of their two oldest sons, James and Kiyoshi. Owning a farm was harder for them than sharecropping. They worked 16 to 18 hours a day raising raspberries and strawberries, a specialty among the fruits and vegetables they grew and that were trucked to nearby markets. They started to prosper. The panic after the attack on Pearl Harbor and Executive Order 9066 changed that. The farm came under attack. “Oil and gasoline tanks were opened and drained on the ground, [the] chicken coop [was] upset, trees and branches [were] dragged across driveways etc. Finally, the property we had held together for 12 years through some of the toughest and trying times was practically given away. Memory of the many years of desperate struggle the family put in is still very keen; and the loss of the farm is still very painful,” James wrote in a memoir he shared with his family. James and Kiyoshi sold the farm to the Curcis, a sale that left a black mark on my family that still endures. “There were long, unhappy arguments around the dinner table about what to do about the farm,” my 80-year-old aunt, Emily Higuchi Filling, says now. While visiting family in San Jose last November, I drove around in the rain with my 85-year-old father, William, Emily, and 94-year-old Aunt Amy, who was married to James, to find the place where the farm once stood. On that trip, my dad told me that as early as the 1960s, whenever he returned to the area on business or to visit family, he tried to find that place. I think that many people who experience a traumatic event in childhood try, in adulthood, to return to that place where the trauma occurred as a way of healing and validating their experiences. For my dad, this meant locating his family’s land and we were able to find it when we received the map of the land from the Santa Clara county assessor’s office. Today, million-dollar homes and the expanded Santa Clara Valley Medical Center fill the land where crops of vegetables and fruit once flourished. Standing there, I felt anger, regret, and sadness combined with a need to find the Curci family and tell them how their ancestors’ actions had lasting effects on my family. Because my father and Emily are Nisei, the stoic, second-generation Japanese Americans that former Heart Mountain prisoner and journalist Bill Hosokawa called “the quiet Americans,” did not express theemotions I felt. After locating the farm, we stopped by the Oak Hill Cemetery to visit the gravesites of my grandparents and James. I hope they came to some semblance of peace with their conflicted feelings about the loss of the farm before they died. While Executive Order 9066 wrecked my families’ homes and businesses, it also paradoxically created something else. In Arkansas James lived in bachelor’s quarters while stationed at Camp Chaffee, a U.S. military base, but his family and that of Amy Iwagaki had another idea. Her parents knew James, and they knew they did not want Amy to go to a prison camp. My grandparents, father, aunt and Uncle Kiyoshi, who was studying at San Jose State College, had no choice. They had to go to Heart Mountain. My Uncle Takeru was exempt, because he was studying outside the exclusion zone in Wisconsin. Amy’s parents arranged for James to write her and ask her to marry him. Shortly after he signed over the family farm, he asked Amy to go to Arkansas so they could get married. At age 20, alone and in a country at war with the nation of her ancestors, Amy boarded an eastbound train in May 1942. “I looked pretty young, [and] felt very young, to be traveling alone across the country on a train. Fortunately a couple adopted me and kept me safe from soldiers and other hazards,” she says. 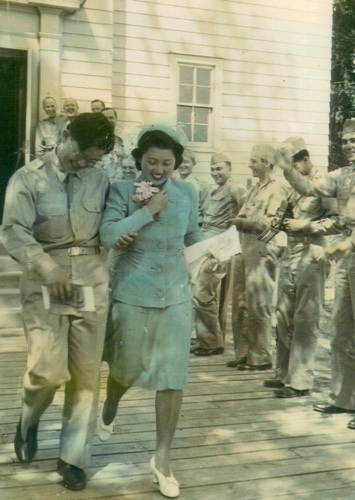 James and Amy were married on Saturday, May 16, 1942, in the U.S. Army Chapel at Camp Chaffee, complete with music, James’s fellow officers and their wives in attendance, and the ritual of throwing rice on the newlyweds. The irony of James’s situation is not lost on me. While James was trying to be a good American and fight for his country, his three siblings, all U.S. citizens, and his parents, Japanese immigrants barred by law from becoming citizens in their adoptive country, were incarcerated by that very county’s government at Heart Mountain. Selling the farm — a source of pride and a symbol of adversity and triumph — must have affected him more deeply than he admitted and to a much greater extent than I can ever imagine. But despite that there is a mixed blessing from the Japanese American incarceration for me. My father, William Higuchi, was a sixth grader when he first started school at Heart Mountain. His class photo shows him next to a poised fellow classmate, Setsuko Saito. Setsuko Saito was my mother. My parents met at Heart Mountain. Without 9066, I would not be here. Still, it’s my hope that no future American families will be formed in this way, because our nation’s leaders did not resist the easy call of racism and overreaction. We can’t rely on ethnic or religious tests for citizenship or admission to our country. It’s the kind of racism that ripped families apart 75 years ago. As Americans in 2017, we must resist the temptation for easy answers to complicated problems. This essay first appeared in the History News Network and is licensed under a Creative Commons Attribution-Share Alike 4.0 License. Shirley Ann Higuchi is a Washington attorney and past president of the District of Columbia Bar. She chairs the board of the Heart Mountain Wyoming Foundation which runs an interpretive center at the site of the camp where her parents were imprisoned. 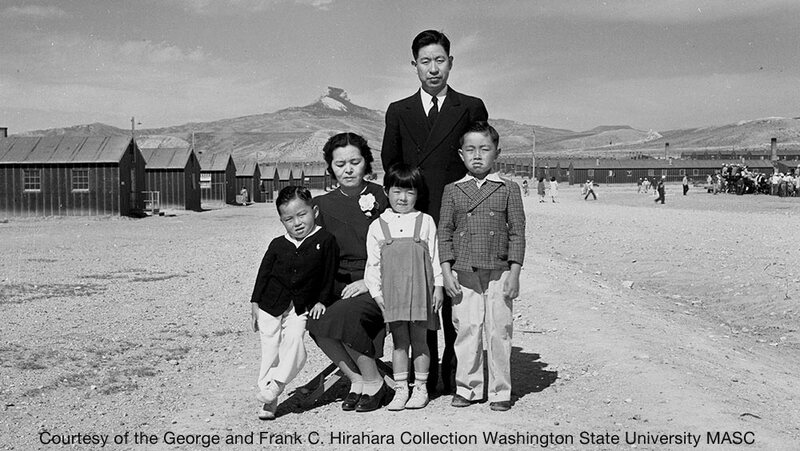 This entry was posted on February 21, 2017 by Vox Populi in Opinion Leaders, Personal Essays, Social Justice, War and Peace and tagged Heart Mountain, invisible Asian, Japanese Internment Wyoming, Shirley Ann Higuchi, Suddenly What Happened to Japanese Americans 75 Years Ago Is Relevant.